Another round of enhancements and the addition of summative events completes step 0 of my open badges step by step guide. I have been building a step by step guide for open badges where I have been creating a number of open educational resources. All this work (and other peoples contributions) is destined to become a part of the School of Open Badges on the P2PU. 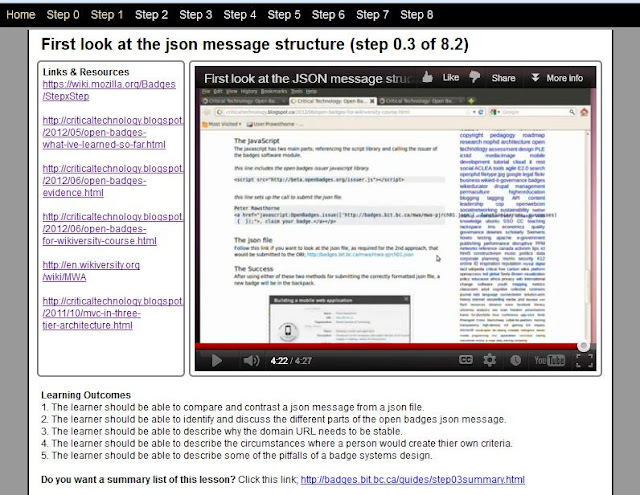 One of the main elements I have been working on is how to enhance screencasts for learning. Just watching a video screencast can be good for learning, particularly when you think about having the ability to stop and start the screencast to view something more than once. The main enhancement I have been working on is to add formative events to the screencast, so the learner can focus on important information and have immediate links to the subject being described. This allows the learner to pause, read deeper, reflect, and then continue with the screencast. click this image to view the enhanced screencast. Formative events enhance learning by providing further opportunities to learn during the overall learning experience. The formative events are immediate and occur as skills and knowledge are forming. The idea of formative events is often used with the idea of a formative assessment, that is in-lined with the learning module and the assessment become a part of the learning. Within my enhanced screencasts I have used popcorn.js to inject links, popups and learning outcomes while the screencast is running. When the learner clicks the link it is opened in a new tab or window, this allows the screencast to continue (or be paused) and the learner to further explore the concept via the linked information (this is not possible with current screencasting technology). The popups highlight important pieces of information. The learning outcomes identify during the screencast. The idea of the summative event is to provide something to go back to and use as an educational resource to reflect and deepen learning. Feel free to enjoy and learn from the growing repository of these enhanced screencasts made specifically to learn about and implement Mozillas Open Badges.